As a mom of four, I am always on the lookout for innovative products that will make my life just a bit easier! 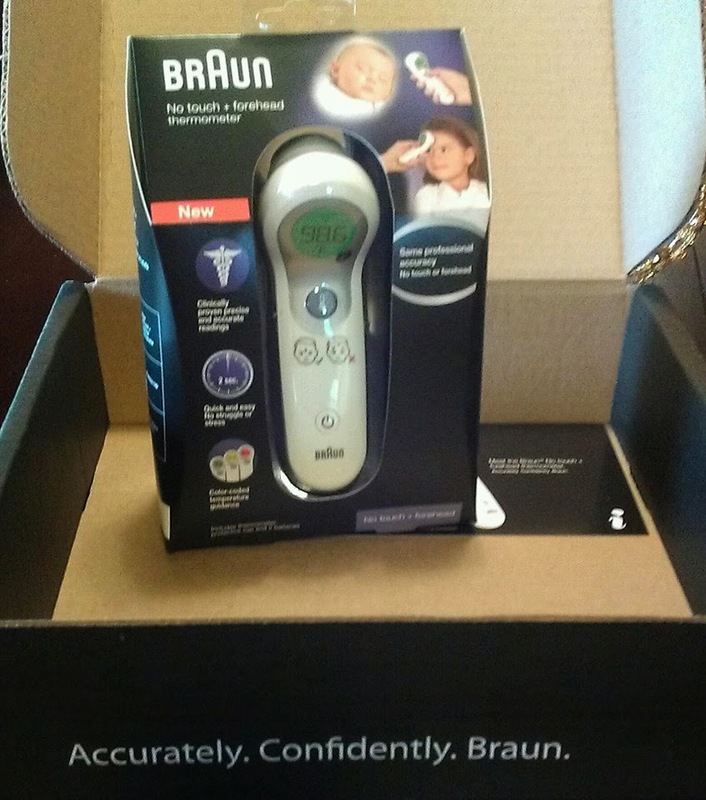 Enter the Braun No Touch + Forehead Thermometer! BraunTherms VoxBox arrived, I immediately opened it so I could try the product! The Braun No Touch + Forehead Thermometer is AMAZING! I don't endorse products unless I really love them, and I truly believe this thermometer is a must have for every mom! The thermometer is so easy to use. You just have to press the button to turn it on, press the temperature button, then move it toward the forehead, between the brows, until it beeps. The screen will light up with the temperature reading, along with a color. Green for no fever, yellow for low fever, and red for high fever. The entire process takes less than 5 seconds! Another favorite feature is the switch on the side that allows you to turn sounds off. This makes it a cinch to take temperatures in the middle of the night, without waking your child up. No touch, no sound, no waking up! This is vital in my book! I wish I knew about this product sooner, especially because Liam's ear canals are too tiny for an ear thermometer. This makes taking his temperature a bit, um, unpleasant. Plus, all those times I had to take temperatures in the middle of the night would have been so much easier! The Braun No Touch + Forehead Thermometer is a game changer! It replaced all the thermometers in my home, and I highly recommend it to all parents! *I received this product for free through Influenster for testing purposes, and gave my honest opinion. I love it! I really do wish I bought one sooner! Sounds like an awesome product. We're in the market for a good thermometer too since the one we have never seems to take the right temperature. You should go for it! Love this one!